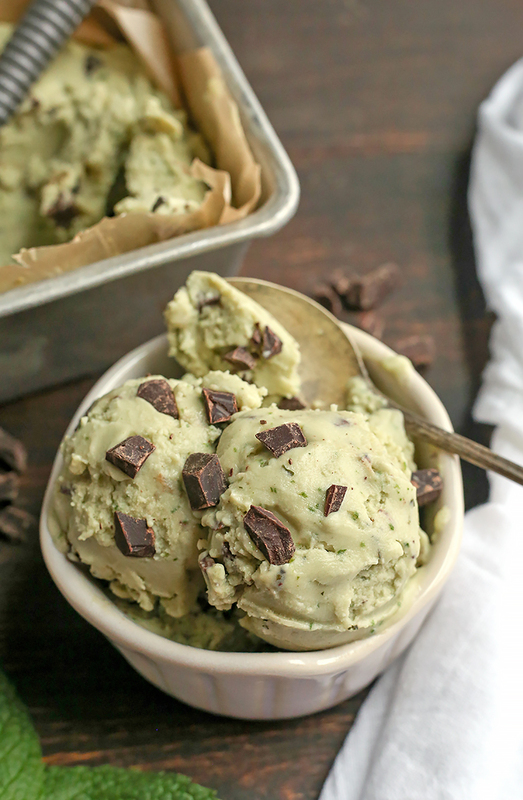 This Paleo Mint Chocolate Chip Ice Cream is easy to make and so delicious! 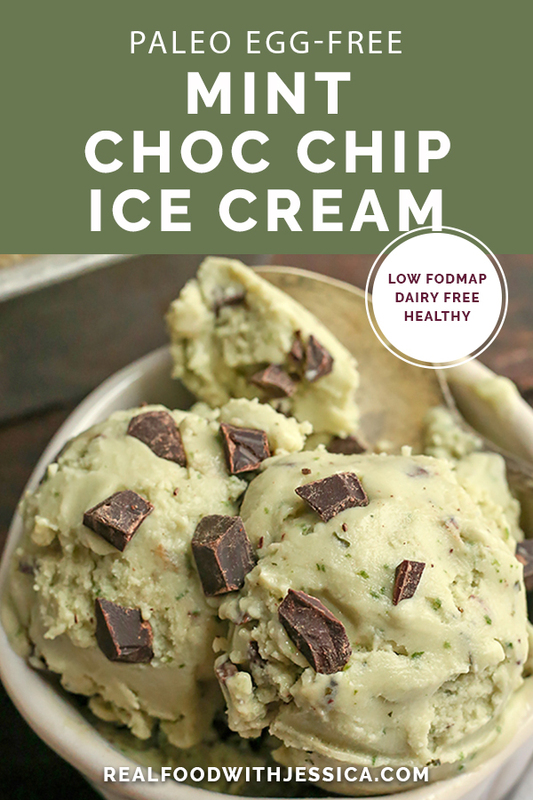 Just 6 simple ingredients, dairy free, egg free, naturally colored and sweetened, and low FODMAP. It’s February and super cold in half the country- so I’m sharing some ice cream!? It doesn’t make sense, but that’s how my brain woks. Once I have something on my mind I just have to make it. A little story of how this ice cream was created. My 3 year old is very into the show and books, If You Give a Mouse a Cookie. She decided that her aunt (my sister) is the cat, and cat loves cupcakes. She wanted to make cupcakes for cat (my sister) since she was coming over to visit. My sister doesn’t love cupcakes, but does love ice cream. So we made this ice cream for her and put it in cupcake liners for her. My daughter was happy we made cupcakes and my sister was happy she had ice cream. It all worked out! About this ice cream. It’s dairy free thanks to the coconut milk. The mint is strong enough that it doesn’t taste coconut-y. I used fresh mint leaves which gives nice flavor and freshness. I do think it will work with extract if that’s what you have. 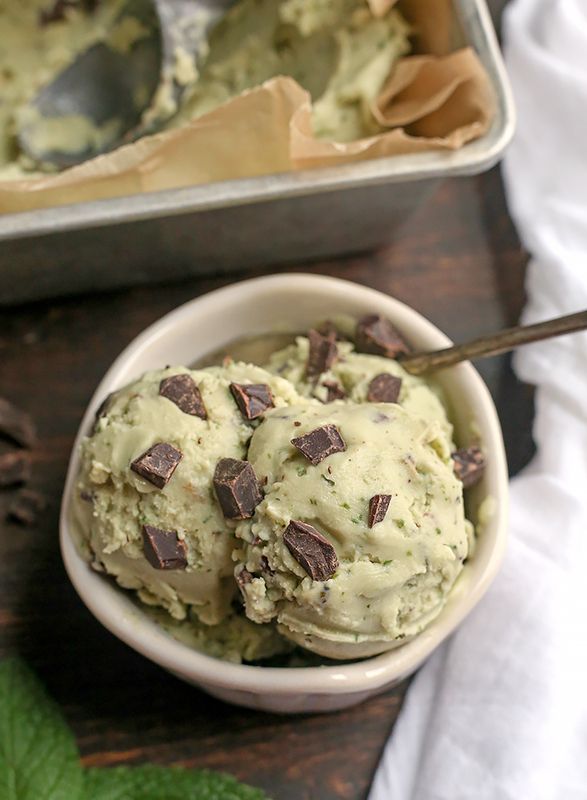 Grass fed gelatin is an ingredient I always like to use which helps keep the ice cream creamy, not icy. For the chocolate, I used a chopped up Eating Evolved chocolate bar. You can use whatever kind of chocolate you like. This is low FODMAP if you keep the serving at 1/2 cup. Coconut milk is low FODMAP up to 1/2 cup so it’s best to not eat too much. It’s sweetened with maple syrup which is an approved sweetener. 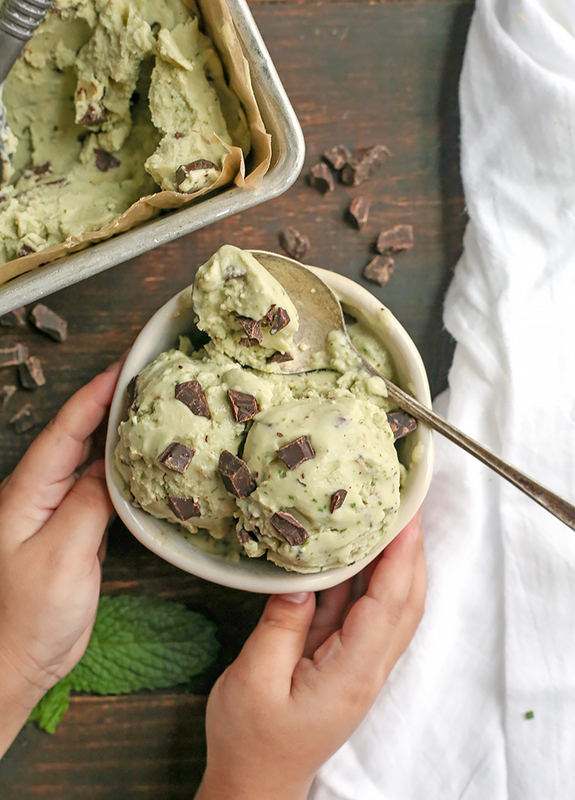 I’m not one to sneak veggies in desserts, but I was looking for a way to make the ice cream green without using avocado and spinach was the answer. I promise it doesn’t taste like spinach (you strain all the pieces out) and it adds a nice green color. You can leave it out if it weirds you out and you don’t care about the color. Or you can use an avocado if you don’t need it low FODMAP. 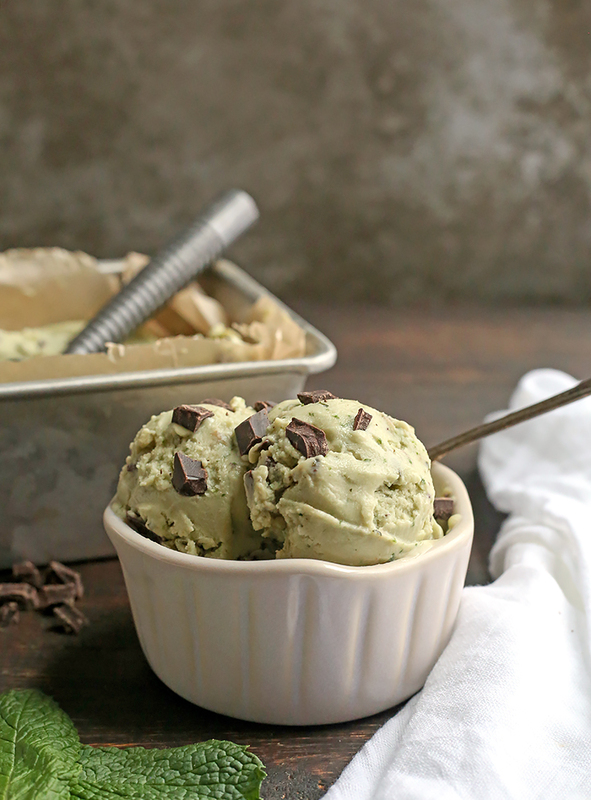 I know you will love this ice cream because it’s creamy, sweetened just right, and so fresh. Studded with chocolate chunks that add a nice crunch. A classic treat turned healthy! Here are some more ice creams to enjoy: Paleo Death by Chocolate Ice Cream, Paleo Pumpkin Ice Cream, Paleo Strawberry Ice Cream. HERE is the ice cream maker I have and love. 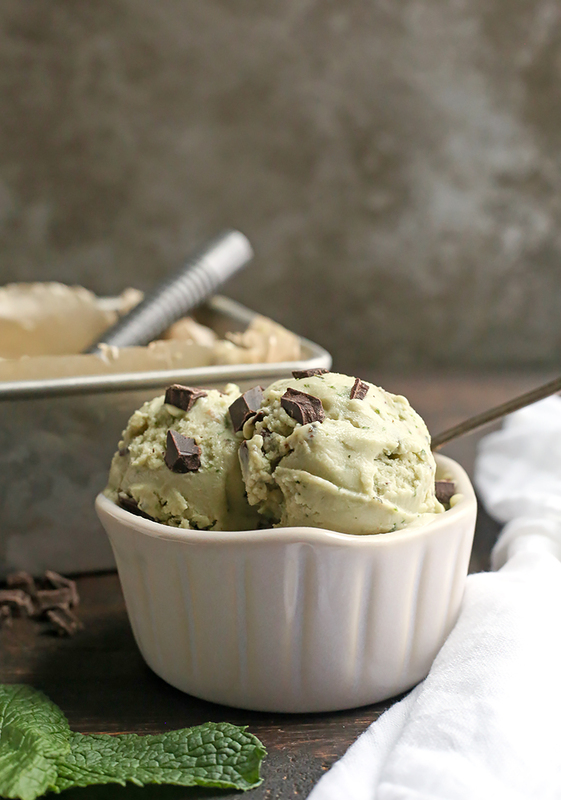 Before you begin, make sure ice cream bowl has been freezing for at least 24 hours. Add the coconut milk, mint leaves, spinach, maple syrup and salt to a high speed blender or food processor. Blend until smooth and mixture is mostly mixed. There may be some small pieces left, that's okay. The mixture may also be slightly separated- that is fine, it will come together when warmed. Pour mixture into a small saucepan and sprinkle the gelatin over the top evenly. Let bloom for 5 minutes (just let it sit). Whisk in the gelatin and turn the heat to medium. Warm until the mixture is smooth and everything is combined. It doesn't need to come to a boil. Pour the mixture through a fine mesh strainer, into a medium bowl. Let cool, then refrigerate at least 3 hours or overnight. Pour the cooled mixture into your ice cream maker and follow manufacturers directions for churning. Mine took about 6-8 minutes. Add the chopped chocolate during the last minute or stir in after churning. 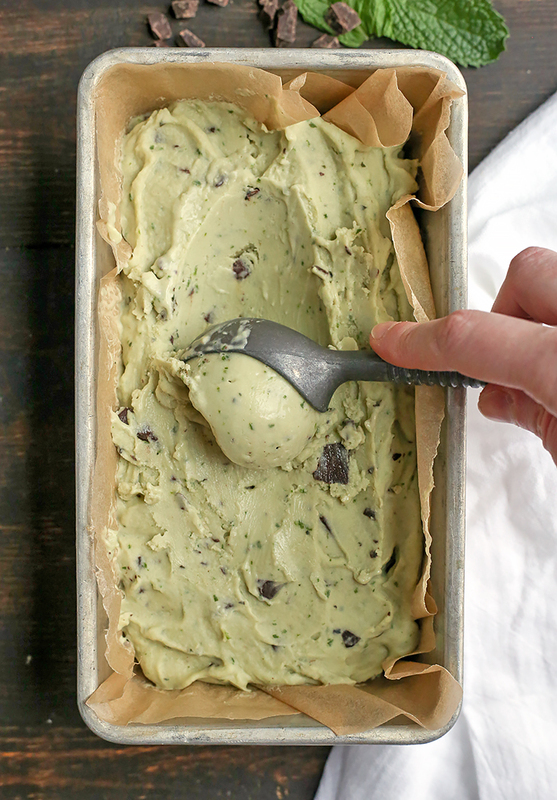 While ice cream is churning, prepare a loaf pan. Line it with parchment paper and cut away any excess that hangs too far over. 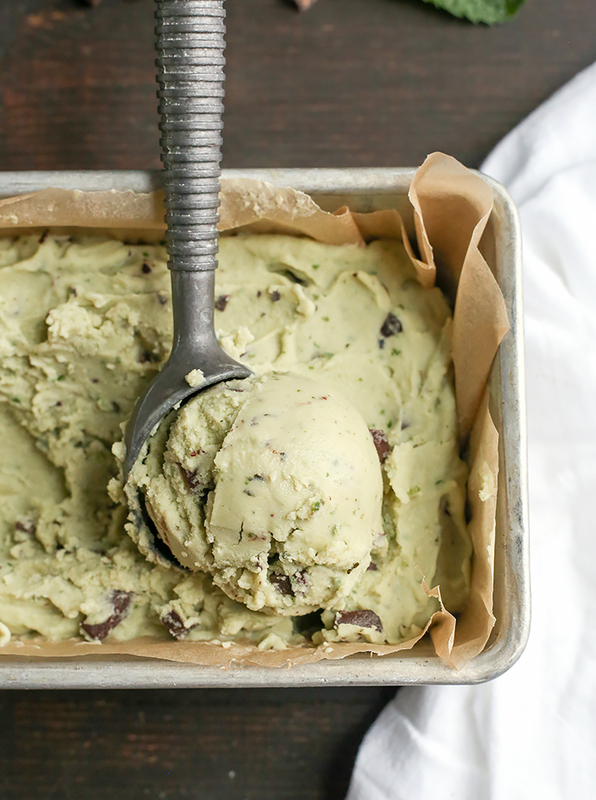 Scoop ice cream into pan then freeze until solid- overnight is best. Or eat right away, it will be the consistency of soft serve. After removing it from the freezer, let sit out for 10 minutes at room temperature before scooping, just to make it easier. *This is an optional ingredient. You can leave it out if you really don't like the idea of spinach added. Or you can use 1 avocado if not needing it to be low FODMAP. **Make sure to keep the serving to 1/2 cup if needing it to be low FODMAP. That is a safe serving.